Over the past two months, my family has made a move to a more plant based diet! So,my husband and I have been collecting our vegetable scraps. When we first began this, we had. Bag in the fridge we would place our scraps. Quickly we realized it would be better to have a freezer continer. So we took a “Tupperware”(not rely Tupperware, but easy to associate) and put it in the freezer. Once we were done slicing. Choping, and peeling veggies, we would just place them in the freezer. Remember to NOT put bitter veggies in the scrap container like, Brussels sprouts, cauliflower, broccoli, cabbage or anything that is starting to rot (duh?!). DO put in celery, garlic, shallots, onions, carrot peels, green onion prices, mushrooms, bell peppers, and herbs like rosemary, parsley, and thyme. When you have about 5 cups of scraps this is what you do: (thank you Thug Kitchen). 1- in a large pot fill with about 9-10 cups of water, add scraps. Here is a shot of the beginning. 2-get this going to a simmer over medium heat. Add 1 teaspoon (I had to add more after the hour. The broth was a little bland) of salt and pepper. Add 2 bay leaves if you have. Let simmer for an hour uncovered to get all the flavors out! Simmering for about 30 minutes. 3-turn off heat, let cool and then strain veggie scraps out. You can freeze broth for later or put in fridge(use in a week). Put your container back in the fridge and start filling it up again! I choose to freeze mine for later use! *I am in no way associated with Thug Kitchen or Tupperware. I just love Thug Kitches recipes and I wish I owned Tupperware! I’m a Thug…Well in the Kitchen! If you haven’t heard about it, please watch this video….Mind you it contains explicit language. I laughed so hard, I almost peed myself…after all the laughs, it made me really think. They were absolutely correct. Luckily for Christmas, my mother gave us the book. This cookbook has helped my family make healthier food decisions and realize what good vegan/vegetarian food is. I’m not going to lie, going from a meat family to making vegan/vegetarian choices is overwhelming. I really thought we would get bored with flavors and items. However, we are not! It has also made us explore flavors and items we have never before. For example, vegan ricotta for lasagna. My favorite part of this cookbook is how it is written. No, I’m not just talking about the foul language…However, I do have a mouth of a truck driver (no offense) can relate to it , and enjoy reading it. What I mean is that the book is written in a way to make it sound like your best friend is telling you how to cook these amazing recipes. It doesn’t read as if it were condescending and making you feel overwhelmed. It’s real and down to earth. It also gives a great description of how the food should look, feel and taste. I also like that if there is an item in the recipe that can be hard to find or substituted they name the alternative. We made the White Bean Balls with Kale Wedding soup. Which was delish! From the recipe we were able to adapt it to a previous dish, zucchini noodle pasta. This time, we made the zucchini noodles, the bean balls and sauce. ½ teaspoon grated lemon zest” -taken from Thug Kitchen online. Like I said this book has helped my family make conscious healthier decisions. I highly recommend it to anyone! 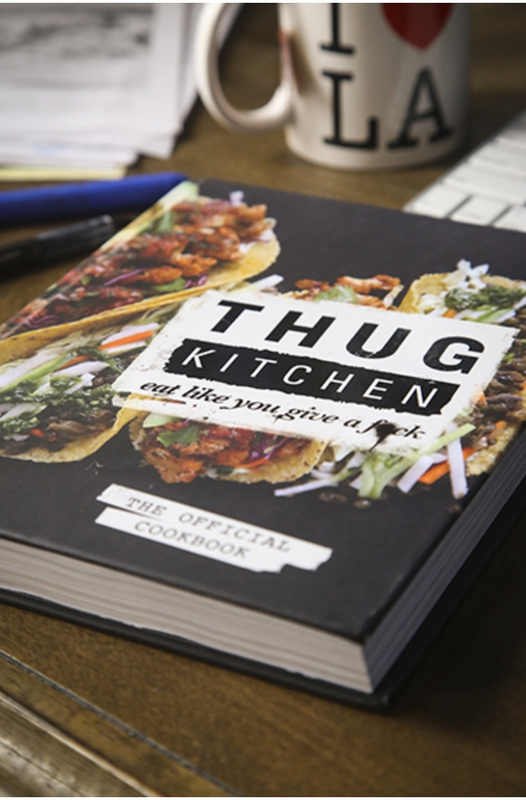 *I am in no way affiliated with Thug Kitchen. I am just a huge fan of their cookbook and had to share! If you want tasty dinners, go buy the f*cking book! Hahaha!